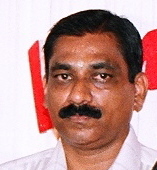 On 21st May 2009, the shocking news of the premature death of Sekar Rathinaswamy, brother-in-law of my Cousin Ramachandran Parameswaran, jolted the family. Sekar was said to be alighting from a train at Shoranur railway station when he accidentally fell down and was overrun by the train. Sekar who was a widower losing his wife a couple of years ago succumbing to Cancer has left his only Son, who has just finished his education and got employed. Our condolences to the bereaved family - Smt. Jayanthi Ramachandran, Smt. Shyamala Krishnan, Shri Sundar Rathinaswamy and Smt. Rathinaswamy, the inlaws of my cousin Ramachandran. We pay homage to the departed soul.